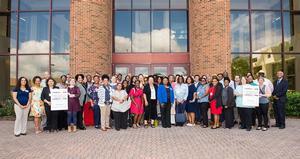 HAMPTON, Va. (September 11, 2018) — The Hampton University William R. & Norma B. Harvey Library hosted the Hampton University Forum on Minority Recruitment and Retention in the Library & Information Science (LIS) Field from August 1-2, 2018. The forum was funded by the Institute of Museum and Library Services (IMLS) through a grant received in the amount of $99,980. The event convened librarians, leaders and experts in library science, diversity, and leadership to address the continued issues of recruitment of minorities to the field. Tina Rollins, University Library Director for Hampton University, served as PI for the grant issued from the Institute of Museums and Library Services – Laura Bush 21st Century Librarians Grant Program, which funded the forum. Raeshawn McGuffie, Assistant Director of Technical Services, served as Co-PI, and Kaysi Bazemore served as Program Assistant. The entire Harvey Library staff and Dr. Vanessa Thaxton-Ward, Director of the University Museum, helped greatly in the planning and hosting of the event. “Hampton University was honored to host the very first conference of librarians of color in 1927. We recently celebrated 150 years of excellence and this forum once again allowed us to help create opportunities for professionals in this field,” said Hampton University President, Dr. William R. Harvey. This conference was uniquely significant to the history of Hampton University. The Hampton Library School was founded in September 1925 by a grant from the Carnegie Corporation. The first and only library school for Negroes to issue a bachelor's degree in library science was accredited by the Board of Education for Librarianship of the American Library Association and, therefore, became a member of the Association of American Library Schools. In 1927, through additional funding from the Carnegie Corporation, the first conference of librarians of color was held at Hampton University, which was attended by 40 librarians from the South. For this year’s forum, the opening session breakfast featured keynote speaker Dr. Ismail Abdullahi, professor of Global Library and Information Science at the School of Library and Information Sciences at North Carolina Central University. Dr. JoAnn Haysbert, Hampton University Chancellor and Provost, and City of Hampton Mayor, Donnie Tuck, delivered greetings on behalf of the university and the city of Hampton. Participants in the forum had the opportunity to hear engaging presentations by dynamic speakers regarding topics of diversity and inclusion within the library and information science field. The event was livestreamed and live tweeted so that others could engage in virtual discussion. The sessions also included workshops which discussed microagression and other behaviors which affect diversity. A strategy session allowed participants to create actionable strategies to address recruitment and retention within the field. The forum proceedings and strategies created during the workshops will be included in a whitepaper. “The forum was a call for librarians to move from talk to action regarding diversity in the field. It was timely and will serve as a catalyst for initiatives and training to improve the experiences of library of color for generations to come,” said Rollins.